Late at night, it’s about 11 PM. We had already packed our stuff for the trip. All members of our company were gathered around a small shop nearby the bus station of Thanh Buoi. Our ride started after 30 minutes of waiting. I rapidly fell asleep after that. During the ride, I woke up several times by the shaking of the bus while it ran into potholes. I realized that there was mist outside. When we arrived in Da Lat city, it was 6 AM and about 25-Celsius Degrees outside. Because the bus station was near the booked villa, the shuttle bus took us to the villa in only 5 minutes. That was a small bus so we all crowded inside. After we arrived the village, I was impressed by the gentle manner of the villa’s owner. They were really friendly. I was in the same room with Phi and Son. That was a double bedroom without air-conditioner. Of course, with the cold environment in Da Lat, who will need an air-conditioner. At 7 AM, we all gathered around and walked to the nearby Pho restaurant. That was the first time of my life I ate Pho with very fresh vegetables. Pho is good enough for me but the fresh vegetables made it better. After that, we walked back to the villa and took a short rest to prepare for next activities. At about 8 AM, we took our rented motorbikes and headed to the Cau Dat Farm. Then we drove out for a short tour of a tea manufacturer. Here we were introduced to the old tea manufacturing process. They also sell tea and coffee here for tourists. 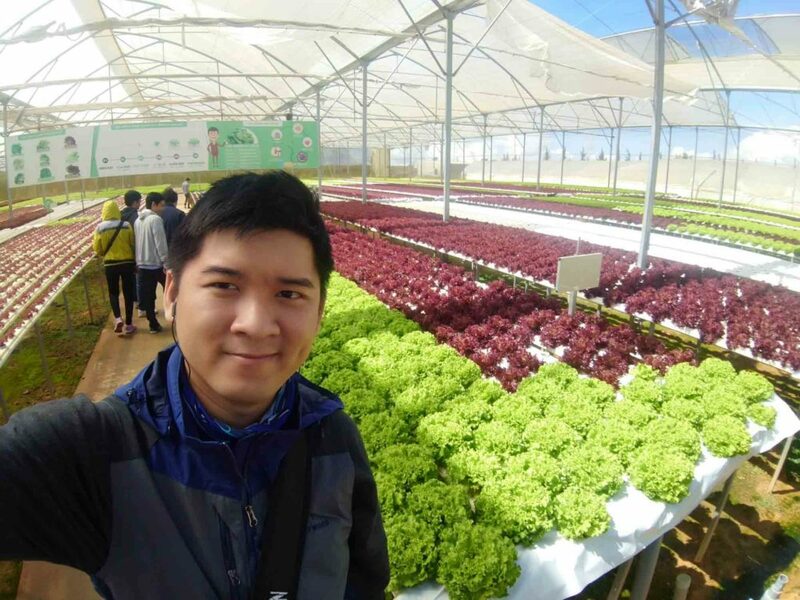 After the tour around the Cau Dat Farm, we returned to Da Lat City and had some Vietnamese foods for lunch. In the afternoon, some of our colleagues went on another trip but I decided to stay at the villa and played some card games with other colleagues while it was raining outside. And then the special event had come, the BBQ Party! We all headed to the Chu Restaurant, which is famous in this area. There were lots of kind of foods here, such as beef, pork, shrimp, frog, fish and fried rice. We enjoyed every moment there. After that, some colleagues continued to visit the Night Market, others and I went back to the villa in the middle of a bit of rain. 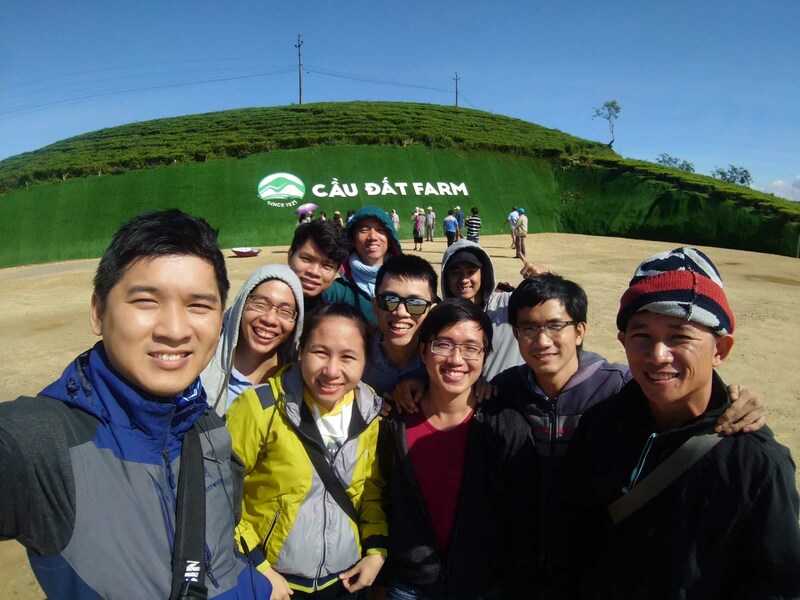 After having a small breakfast, as planned, we went to the Langbiang mountain which is the highest mountain in Da Lat for sightseeing. The mountain is managed by a tourism company; therefore, we were able to ride onto the mountain by our own bikes. After buying entrance tickets, we were ridden by an old Jeep car to the top of the mountain. 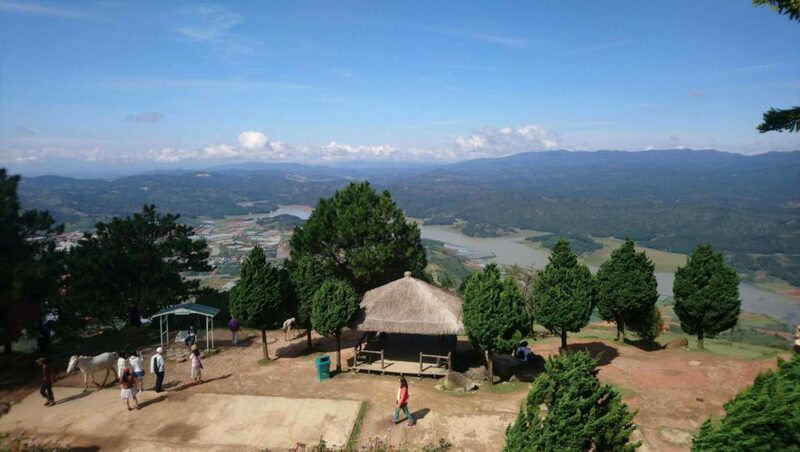 When we arrived, there is a lot of fresh air here and you can see all the Da Lat City from above. The sky is very clear. 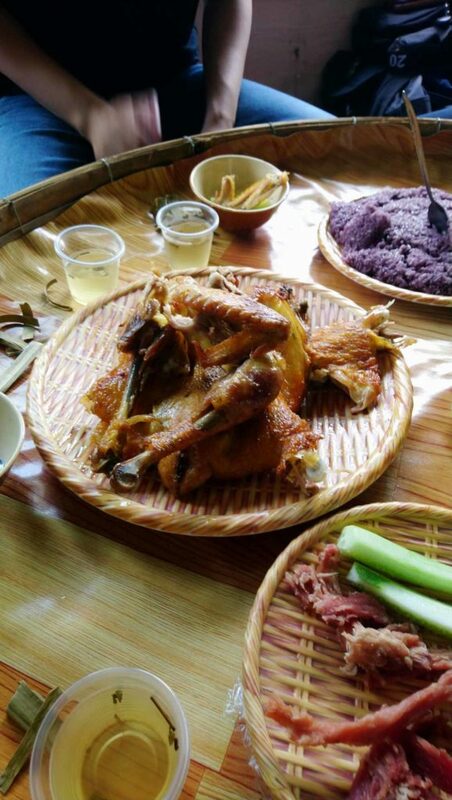 After that, we returned and had a traditional lunch with chicken at the bottom of the mountain. We also had a small trip to the small haunted house before headed back to the villa. The haunted house was rebuilt and nothing special to see there because we visited it in the middle of the day. We saw a statue of Guanyin in front of the house and a woman who was taking care the house. The rumor is that many of the girls died injustice during the war in this house. So their soul still stay here and could not escape from the house. The weather was rainy in the afternoon like the day before, so we decided to stay at the villa and played poker together (not for money, just for fun…). When the weather was better, we went for dinner at a small but crowded restaurant which was located at the end of a small alley. We ate Beef Hot Pot that night. Then we visited the Night Market where some of us bought fruits to bring back home. I personally bought a cute warm hat as a present for my girlfriend. Then we went back to the villa, enjoyed some more poker matches before going to sleep. Already the last day of our trip. We packed up our stuff and were ready to head back home. As the bus started to drive, there was a small rain on the way as a farewell for us. I really enjoyed the trip and would like to come back here again. PreviousPrevious post:Managing the largest risks in Global Software DevelopmentNextNext post:How to make your outsourced software project to a success? Thank you to everyone who joined us at our Christmas 2018 event!